The Company guarantees the drum correspondence with the required standards at the stated terms of transportation, use and storage. The warranty term of storage is 12 month from the date of putting it into use, the term of storage of empty drum with inner covering – from 1 to 3 years, without inner covering -1-3 months, in accordance with the terms of storage. The real shelf life of the drums can be long, and is indicated in the warranty. The term depends on the terms of storage and use. The steel drums are used for transportation of dry and solid products and substances, that don’t influence on steel. 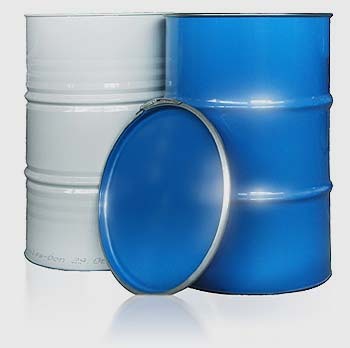 This package is used in chemical, petrochemical, metallurgy, paintwork and food industries. The inner covering from phenolic resin material increases the spheres of drums use. The quality and technical characteristics of drums correspond the requirements of Russia GOSTs and UN recommendations to the transportation and storage of hot cargo of I, II, III categories. Strict requirements to the manufactured products provide not only the safety of packed product, but the environment and people safety. NOTE Second washed containers may be delivered.